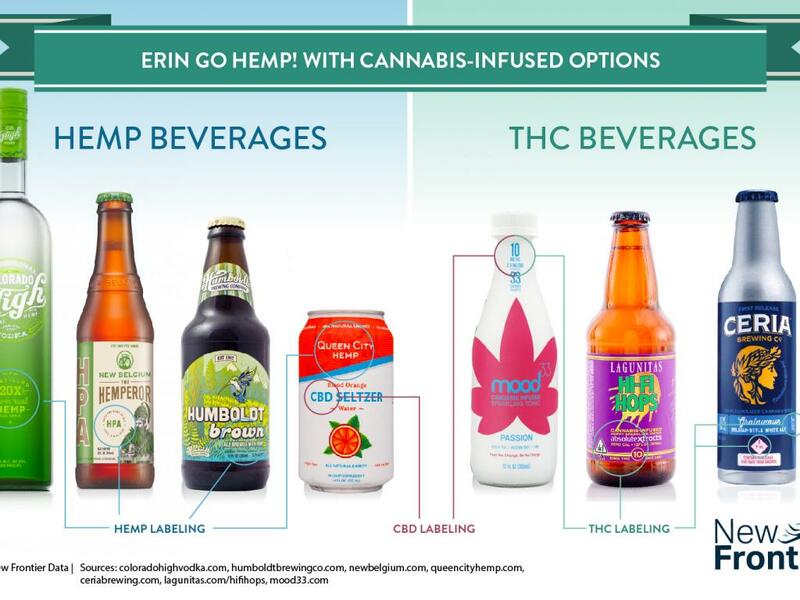 With a Saint Patrick’s Day weekend in sight, the occasion seemed right for the Hemp Business Journal to get into the holiday spirit with an update about the current state of hemp- and cannabis-infused beverages. As detailed in a survey last October by New Frontier Data (parent company of the HBJ), nearly half (45%) of cannabis consumers who also drink expected to eventually replace at least some of their alcohol use with cannabis. For those who enjoy the taste and traditions yet worry about the health effects of alcohol, a new profusion of non-alcoholic, cannabis-infused beer and wines are offering some intriguing potential replacements (where legally available). The Hemperor HPA – For those who like their beer like their rabbits, there is New Belgium Brewing’s aggressively hoppy hemp-inspired beer. The Hemperor HPA (Hemp Pale Ale) includes no CBD, but it does contain hemp seeds and terpenes for a full, rich hemp flavor. But just because there is no CBD does not mean that it should be underestimated: The Hemperor has an ABV of 7%, so be sure to drink responsibly. Humboldt Brown Ale – For a beer to pair happily with a burger, Humboldt Brown Ale might begin a beautiful friendship. Featuring toasted hemp seeds, Humboldt Brewing Company’s offering has a warm herbal flavor with hints of roasted nuts and caramel. With an ABV of 5.7%, it is slightly stronger than a standard beer, but not so much as to send one home early. Colorado High Vodka – If beer is not one’s cup of tea, Colorado High Vodka offers yet another option for celebrating the holiday. Fermented and distilled with hemp mash, Colorado Gold Distillery’s signature novelty delivers a unique hemp-flavored mash that goes down much more smoothly than some other vodkas. Like the Hemperor and Humboldt Brown Ale, it has no CBD, but at 80 proof tipplers will enjoy themselves PDQ, regardless. Queen City CBD Seltzer – Designated drivers need not feel neglected from the fun, thanks to a non-alcoholic option. Made with U.S.-grown hemp, 100% vegan Queen City CBD Seltzer contains 5 milligrams of CBD per serving without any calories, sugar, or caffeine to be found among its four flavors: Blood Orange, Passion Fruit, Guava, and Lemon Lavender. Especially with Saint Patrick’s Day on a Sunday, Queen City CBD Seltzer offers a guilt-free choice. 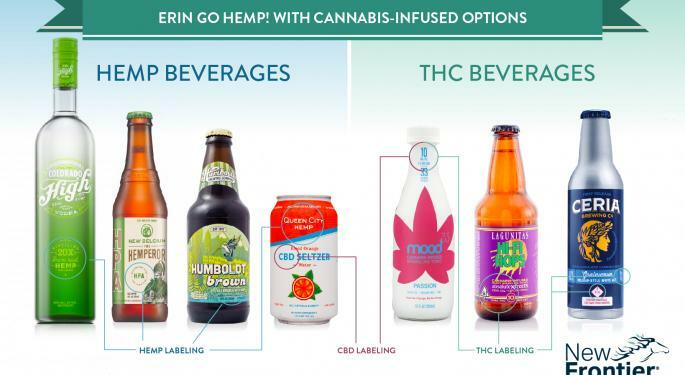 Grainwave – Craft beer meets craft cannabis through a THC-infused cannabis beer. Made by the folks formerly behind the Blue Moon Brewing Company, the Ceria Brewing Company’s cannabis-inspired Grainwave is a different spin on a Belgian-style white ale: Though there is no alcohol to be found in a Grainwave, each serving of the “de-alcoholized” brew contains 5 milligrams of THC (about half that of a standard edible serving), sufficient to ensure a high old time in Colorado (where distribution is currently limited to 20 Denver-area dispensaries) this Saint Patrick’s Day. Hi-Fi Hops – Made by the Lagunitas Brewing Company, Hi-Fi Hops is an IPA-inspired sparkling cannabis beverage offered in two versions. One combines 5 milligrams of THC with 5 mg of CBD in each serving, while the other has 10 mg of THC without CBD. Like Grainwave, Hi-Fi Hops is alcohol-free, but it’s also free of carbs and calories to weigh down anyone’s spirit. Mood 33 – A cannabis-infused sparkling beverage, Mood 33 holds no pretense of being a cannabis-inspired beer, aiming instead toward delivering a bubbly mood-lifting experience. Mood 33 comes in three flavors, each one dedicated to invoking a particular experience: Joy is a peppermint-and-lemon option with 33 calories and 10 milligrams of THC per serving; Passion contains 10 mg of THC and 2.5 mg of CBD with a tart flavor of passion fruit with hints of green tea and lime; and with a twist of chamomile, hibiscus, and raspberries, Calm gently delivers peace of mind via 10 mg of THC and 5 mg of CBD.